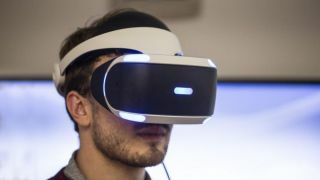 LCD manufacturer Japan Display (JDI) has developed a virtual reality-ready screen that more than doubles the pixel quality you’ll find in nearly all of the best VR headsets on the market. JDI, a joint org comprised of Sony, Toshiba and Hitachi, announced this week that its new 3.25-inch screen comes with 1,001 pixels per inch (ppi). With higher image quality, JDI said, headsets can be smaller and lighter than ever before. Currently, the HTC Vive Pro comes closest to this number with 615 ppi, while the HTC Vive has 448 ppi, the Oculus Rift has 461 ppi, and Playstation VR has only 386 ppi. Considering Sony makes PSVR and commits significant resources to JDI, it's possible that the next iteration of PlayStation VR could potentially come with two of JDI’s pixel-dense screens built in. Sony previously used JDI’s 6-inch, 18:9 displays for its newest smartphones. JDI announced that its new screen would ship out by late March 2019. The company JDI also said its screen has a 2.2msec response time for reduced latency, a 120Hz refresh rate, and a resolution of 2,160 x 2,432. That beats out PlayStation VR’s current 1920 x 1080 resolution. The HTC Vive Pro has a combined resolution of 2,880 x 1,600. Japan Display's new screen may not be the best impending display headed to the market. Google is developing an 18-megapixel OLED display that measures 4.3 inches, has 1,443-ppi and a 120Hz refresh rate. The resolution of this display is reportedly 5,657 x 3,182 per eye. Both Google and JDI’s new VR-ready screens will be shown at Display Week 2018 in Los Angeles later this month, where the company will seemingly battle it out for supremacy in the next-gen VR market. One thing is for certain: these displays aren’t for mobile or standalone devices like Google Daydream View, Oculus Go or the Lenovo Mirage Solo. To hit that kind of resolution, you need PC levels of processing power. So, does that mean a new Google competitor to the high-end VR market is coming to take on Sony’s PlayStation VR, along with HTC and Oculus? We could find out more before the month is out.